One is purple, one is pink, and one is blue, and it took 40 scientists from 17 countries to find them, more than 4 miles below the ocean’s surface. 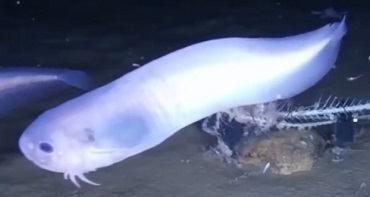 They are three new species of snailfish discovered in one of the deepest places on earth, the bottom of the Atacama Trench off the coast of Peru and Chile. A team led by researchers at Newcastle University in England has been exploring the deepest parts of the ocean with specialized landers fitted with HD cameras and traps. The landers free-fall to the ocean floor, in this case 24,600 feet below the surface, take photographic and video images, and collect samples. The devices collect data for up to 24 hours before the researchers send an acoustic signal that releases weights in the lander, allowing it to float to the surface so the researchers can collect their scientific booty. This research group has already deployed such devices more than 250 times and discovered new snailfish species at the bottom of the Mariana Trench. The Atacama snailfish they found are translucent, eellike fish that lack scales and feed on invertebrates in the trench. Their body tissue is almost entirely gelatinous, well adapted for the extreme conditions at such depths. But since they depend on the high pressure and low temperature to stay in one piece, it is extremely difficult for scientists to bring these fragile fish to the surface without them nearly melting away. Nevertheless, researchers managed to bring a live purple Atacama snailfish safely aboard, giving scientists the opportunity to observe and learn from this new species.